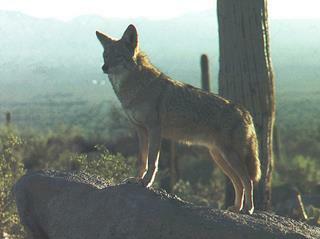 The specific name for Arizona Coyotes is Canis Latrans. These fascinating animals are common in both rural and urban areas throughout AZ. They tend to travel and hunt alone or in pairs, but they can form groups where food is abundant, as noted by Arizona Game and Fish. They have become increasingly more visible as humans encroach their natural habitat. Over the years, they have adapted to humans and are no longer found solely in the Western plains and deserts. They have made their tracks throughout all parts of the country, except to Hawaii. Arizona coyotes generally do not pose a threat to humans, but there have been times when they have attacked humans. The information was able to find regarding attacks on humans all pretty much said the same thing, the very few attacks that have occurred, were on small children, so if you have small children, just be cautious. Occasionally I will hear news reports of these rare attacks. These wild animals will attack your small cat or dog, so you do need to be aware and cautious. They won't generally attack dogs because they do not view dogs as prey, but I have heard on more than one local news channel that a coyote attacked and or killed another dog that was innocently sitting in the backyard. 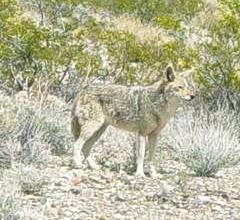 These coyotes likely view backyards as their territory. If I had a dog, I would be extremely careful about leaving him/her outside without any solid and tall barrier. That being said, I personally know someone who actually had his little dog killed INSIDE his blocked in wall which is a good 6-feet tall... so even though you have a wall or some sort of barrier, I would caution you against leaving your dog, cat, or any pet unattended. Coyotes are obviously good at climbing walls and if they are hungry, they are going to find their next meal. Like I said, they will attack dogs if they feel the dog is a threat to its territory or its young. There have been many times when I have come close to a coyote but they have always run the other way, which is just fine, except for the fact I am always looking for my next camera shot or video clip! I do a lot of hiking so I frequently see them just several feet from where I am. They don't seem to be interested in me...they are usually running so it is hard to get a good picture. It is not uncommon to hear local news channels reporting stories of how a deadly attack happened when their pet became the prey of this animal. It does happen and I have heard about these very unfortunate mishaps myself, and am constantly reminded that I personally need to be very careful when it comes to my own pets. Just because they think they are the biggest cats that ever walked the desert Arizona floor, they would definitely be a more than an appetizer to a pack of coyotes. Arizona coyotes are very much alive here in the Sonoran desert and there isn't a week that goes by when you don't hear them howling at night. You certainly do not have to be out camping in the woods to be able to hear their cries in the night. Sometimes just before the sun rises, I have heard them as well. It is usually around 5 AM. I have become quite used to their presence and am usually awakened when they are "on the prowl." Arizona Game and Fish will tell you the coyote is the most commonly seen wild animal here in the state of Arizona and also an important fur resource. Where you will find them is usually in open areas where their food is plentiful. Basically, you will see Arizona coyotes wherever they are able to find a food source. My subdivision is no exception! As I previously mentioned before, I have witnessed many of them running around in the residential streets here in Gold Canyon and in Apache Junction, which is just several miles west of where I live. On another occasion, I saw one just north of the US Highway 60 in Apache Junction. I was so fearful that he was going to get struck by a car, as he was just inches from my car on the off ramp from US Highway 60. I don't know what happened to him; I just remember hoping that he did not get hit by a passing vehicle. On that note, I have seen many coyotes lives ended when they were obviously hit by a car. You will commonly see many of them laying by the side of the road. As an animal lover, it makes me sad to see this each and every time. For me, it is something that I just don't "get used to." You just feel for them. At least I do. They are primarily nocturnal hunters and the diet of a coyote is one of many small wild animals such as rabbits, rodents, such as mice, small deer, snakes, lizards, and of course the previously mentioned animal, domestic animals. One of the things I learned when researching coyotes is that they will also eat fruits and vegetables, that according to Arizona Game and Fish. One can always tell by their droppings... what you will see are the seeds of the fruit within... Their food requirements change during their breeding season as they will greatly increase their food intake. Generally speaking, Arizona coyotes stay fairly close to their home, but they have been known for this range to dramatically increase upwards to 100 miles or more. When hunting, they usually can be found by themselves or in pairs. However, they can sometimes be found in larger groups when the population density increases. Sometimes they will hunt in larger groups if food is very plentiful. If necessary, Arizona coyotes will also eat any leftover garbage carelessly left outside. It is important to note they will also eat your pets food, if you leave it outdoors. So, if you live in Arizona, and you don't want to attract these wild animals from coming into your backyard, you should avoid leaving food outside and never throw food out for them, as they will become accustomed to this practice and begin to expect this. Adults will weigh anywhere from 20-30 pounds and are typically between 18-21 inches tall. Game and Fish report that Arizona coyotes length range anywhere from 42-50 inches with their average weights equaling about 21 and 17.5 pounds, respectively. Game and Fish also state that some males can reach weights as heavy as 35 pounds. If you have seen a coyotes ears, you know that they are distinctly different than a dogs ear as they are much more erect. Other points to help you distinguish a dog from a coyote are as follows. Canis Latrans have black patches found at the base and tip of the tail. They also have dark markings on the outer areas of their coat. You will also see gray and rust coloring on their neck and on the sides of their bodies. You will also see that they will carry their tail lower than that of a dog. Though some might believe that they will breed with other dogs or wolves, Arizona Game and Fish discount this idea. When the female produces a litter, she will usually have 4-5 pups. The pups are born in dens which can include such areas where adequate vegetation will conceal the Arizona coyotes den. Their breeding season is between the months of mid-January and March 15 and go go through a short two-month gestation period. Almost "right out of the gate," as they say, the young little coyotes are pretty independent at just the tender age of one month. The pups will remain with their parents until they are about 8-10 weeks old, which is summer as well as early fall. Until they leave the den, the pups are fed their parents regurgitated food. I discovered some other interesting facts, thanks to Arizona State University. Their research shows they will stay with their mates for life. The university also stated that while on average the females give birth up to 12 pups every year, however only an average of 5-20 percent will actually survive. Born blind, the pups eyesight develops at about the three-week mark. Another interesting fact is that although both parents care for the pups, the mother Canis Latran will not allow the male to enter the den. In addition, a coyote is "digitigrades," which means they walk on their toes. Those were some very interesting facts and stories about the Arizona Coyotes. I hope you enjoyed them as much as I did!